Sometimes we see some new works in other non-english gamebook communities that surprise us because of their quality. 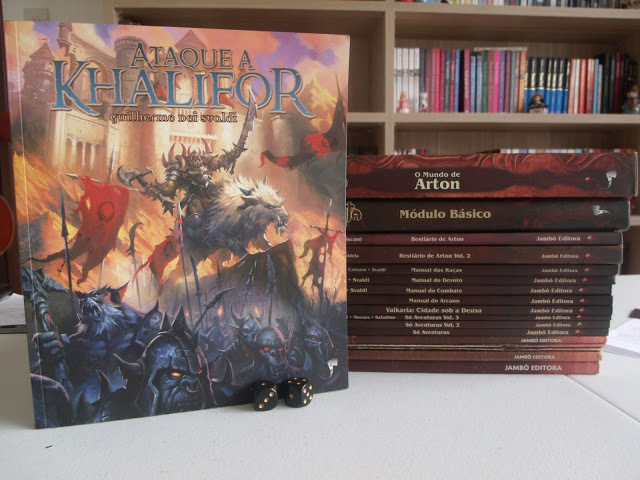 I think “Ataque a Khalifor” (“Attack on Khalifor”), a new title from Brasil, based on their popular RPG setting “Tormenta“, is a good example of that. This review is translated from the Brasilian blog “Multiverso X“. We thank the people in the blog and the author Ace Barros for giving us the opportunity to translate his article. You can find a link to the original content HERE. 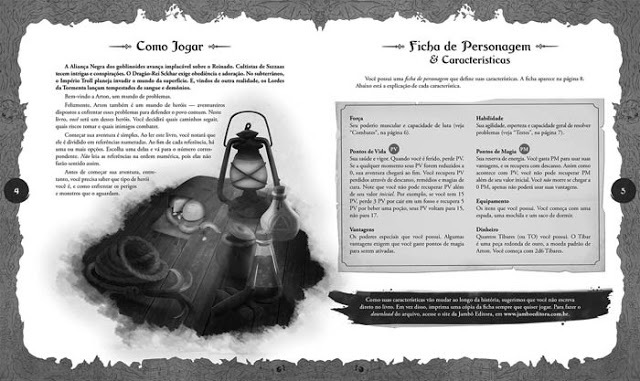 “Confront the Dark Alliance, with the first Gamebook of Tormenta! “Before dying, the spy reported what he saw. More banners on the ramparts of the fortified citadel, indicating the arrival of new war soldiery. Leaders shouting orders, indicating that the soldiery would part for an attack. And slaves carrying carriages with supplies, indicating that this attack would be soon”. “It cannot be denied anymore. The Dark Alliance is moving. The Kingdom will be attacked”. Tormenta is the greatest RPG setting of this country, and it also served as an inspiration for the comic book series Holy Avenger, Ledd, DBride and 20Deuses, and also several novels and short stories. Even though it tells a new chapter of the history of this setting, “Ataque a Khalifor” isn’t exactly a new novel. Neither it is a typical RPG adventure. It is in fact a combination of both. Yes, exactly that same kind of books we were writing about in the post “Gamebooks – to know more, go to page 42“. Don’t worry! 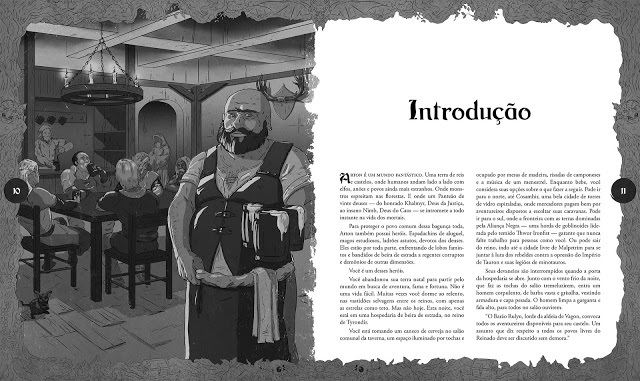 I will not force you to go there and read about all that to understand this entry; I will use instead the brief explanation given by the staff of Jambô: A gamebook is exactly what its name says: a combination of a book and a game, in which you read a story, but instead of following the protagonist, you take choices for him. And in “Ataque a Khalifor”, once you pick up the book, those choices will decide the future of Arton! In this plot, a dying spy warns that the Dark Alliance – a powerful army of evil creatures – is about to start attacking the kingdom, so Baron Rulyn sends an adventurer hero, with a daring plan. To invade the city-fortress of Khalifor, the heart of the horde, and discover their plan of attack. Only with this information, the Army of the Kingdom will have any opportunity in the approaching battle. The fate of everyone is in the hands of just one hero. And that hero is… You! 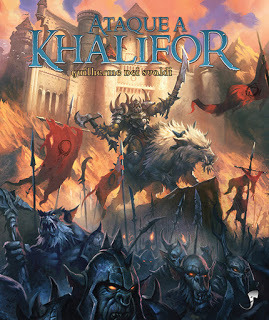 “Ataque a Khalifor” is written by Guilherme Dei Svaldi, illustrated by Estevan Silveira, has the graphic and layout design of Daielyn Cris, cover by Caio Monteiro and editing by Leonel Caldela. And if you are worried by the fact that you don’t know the world of Arton or anything about RPGs, forget about that and focus on saving the world. It also has a simplified rules system to help keeping everything in order and concentrating in what’s interesting. After all, what would be the fun of the adventure without challenges and a bit of luck? 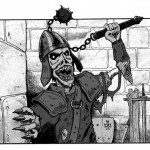 You can use a pre-generated character or create your own choosing seven races (humans, dwarves, elfs, goblins, halflings, minotaurs or qareen), four classes (warrior, thief, mage or cleric) and several skills. All you need to know to enjoy this adventure is inside the book, apart from that you only need to take a blank page and a pair of dice. 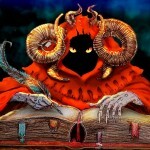 This could be just another interactive book or another good gamebook, like the Fighting Fantasy series, but Svaldi has given us an adventure worthy of the greatness of Tormenta. To have an idea of the size, I will only say that with all the content shown in relation to the conspiracy to attack Khalifor, a thrilling novel could have been written! Can you imagine all that possible thrill being YOU the protagonist? You are not going to be any hero, but a central character, changing the course of the plot with every step. I am not exaggerating, this is, literally, “a renounce on every choice”. Choosing the race and the class, selecting the powers, buying or not buying an object, progressing through the longest path or through the shortcut, being altruistic or selfish, being sociable or not, a success or a failure on a Strength or Ability test, everything is important to bring you closer to save the civilisation or to a horrible death. Don’t think it will be easy to reach the final ending! Oh, but it’s not the same! Trying to memorize the best options when using a new character won’t make things easier, I say it from personal experience. Every attempt, the book offers a new possibility, be it from having new options, or from the luck of the dice. I was a combative dwarf warrior, a clever thief well versed in crime, a Qareen – a half-genie – cleric, expert in arcane and divine spells, and each of these things took me to completely different details of the story, and it was nice to see how these small details filled the gaps in the plot. There are many hidden surprises! As in any good story, friends and enemies will also appear and stand out in the attack to Khalifor. Be it from their direct actions or by their influence, many of them will get more space in the story, and grow their significance, but telling more about this would make spoilers and interfere in your choices. The scenery is alive, and every change can be felt during the travel, both in the descriptions and the events surrounding them. The open fields are clearly different than the forest, which are also different to the cities and the dungeons, making it all much more varied. By the pages that can be seen above, and the cover that can be see below, there’s no need to say that the book part is flawless, right? All the team involved must be congratulated. Every version you choose to own, physical or digital, will get you impressed with the details. “Ataque a Khalifor” is at the same time an introduction to the Tormenta setting, that will help you getting in touch with other products connected to the line (the comics previously mentioned, novels and RPG), a solitaire adventure for enthusiasts, and an epic novel that will ensure many hours of pretenceless fun with a good story, lovable characters and a good dose of action and adventure for a beginner reader/player. So, what are you waiting to answer the call of Baron Rulyn and save the kingdom?